This mineral form of lead sulfide is called galena. The term sulfide (sulphide in British English) refers to several types of chemical compounds containing sulfur in its lowest oxidation number of −2. Formally, "sulfide" is the dianion, S2−, which exists in strongly alkaline aqueous solutions formed from H2S or alkali metal salts such as Li2S, Na2S, and K2S. Sulfide is exceptionally basic and, with a pKa greater than 14, it does not exist in appreciable concentrations even in highly alkaline water, being undetectable at pH below ~15 (8 M NaOH). Instead, sulfide combines with protons to form HS−, which is variously called hydrogen sulfide ion, hydrosulfide ion, sulfhydryl ion, or bisulfide ion. At still lower pH values (below 7), HS− converts to H2S, hydrogen sulfide. Thus, the exact sulfur species obtained upon dissolving sulfide salts depends on the pH of the final solution. Aqueous solutions of transition metal cations react with sulfide sources (H2S, NaSH, Na2S) to precipitate solid sulfides. Such inorganic sulfides typically have very low solubility in water and many are related to minerals. One famous example is the bright yellow species CdS or "cadmium yellow." The black tarnish formed on sterling silver is Ag2S. Such species are sometimes referred to as salts. In fact the bonding in transition metal sulfides is highly covalent, which gives rise to their semiconductor properties, which in turn is related to the practical applications of many sulfide materials. In organic chemistry, "sulfide" usually refers to the linkage C-S-C, although the term thioether is less ambiguous. For example, the thioether dimethyl sulfide is CH3-S-CH3. Polyphenylene sulfide (see below) has the empirical formula C6H4S. Occasionally, the term sulfide refers to molecules containing the -SH functional group. For example, methyl suflide can mean CH3-SH. The preferred descriptor for such SH-containing compounds is thiol or mercaptan, i.e. methanethiol or methyl mercaptan. Confusion arises from the different meanings of the term "disulfide." Molybdenum disulfide consists of separated sulfide centers, in association with molybdenum in the formal 4+ oxidation state. Iron disulfide on the other hand consists of S22−, or S−-S−, in association with iron in the formal 2+ oxidation state. Dimethyldisulfide has the connectivity CH3-S-S-CH3, whereas carbon disulfide has no S-S linkages, being S=C=S. Cadmium sulfide (CdS) can be used in photocells. Calcium polysulfide ("lime sulfur") is a traditional fungicide in gardening. Carbon disulfide (CS2) is sometimes used as a solvent in industrial chemistry. Lead sulfide (PbS) is used in infra-red sensors. Molybdenum disulfide (MoS2), the mineral molybdenite, is used as a catalyst to remove sulfur from fossil fuels. Silver sulfide (Ag2S) is formed on silver electrical contacts operating in an atmosphere rich in hydrogen sulfide. Sodium sulfide (Na2S) is an important industrial chemical, used in manufacture of kraft paper, dyes, leather tanning, crude petroleum processing, treatment of heavy metal pollution, and others. Zinc sulfide (ZnS) is used for lenses and other optical devices in the infrared part of the spectrum. 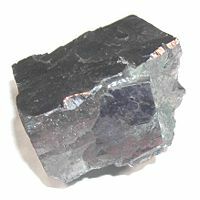 Zinc sulfide with a trace of copper is used for photoluminescent strips for emergency lighting and luminous watch dials. Several metal sulfides are used as pigments in art, although their use has declined somewhat due to their toxicity. Sulfide pigments include cadmium, mercury, and arsenic. Polyphenylene sulfide is a polymer commonly called Sulfar. Its repeating units are bonded together by sulfide (thioether) linkages. Many metal sulfides are so insoluble that they are probably not very toxic. Some metal sulfides, when exposed to a strong mineral acid, including gastric acids, will release toxic hydrogen sulfide. Organic sulfides are highly flammable. When a sulfide burns, the fumes usually include toxic sulfur dioxide (SO2) gas. Hydrogen sulfide, some of its salts, and almost all organic sulfides have a strong and putrid stench, as rotting biomass releases these. Mercaptans, in particular, are the strongest-smelling substances known. Chang, Raymond. 2006. Chemistry. 9th ed. New York: McGraw-Hill Science/Engineering/Math. ISBN 0073221031 and ISBN 978-0073221038. This page was last modified on 2 April 2008, at 17:11.